A strain (also known as a pulled or torn muscle) is an acute or chronic soft tissue injury that occurs to a muscle, tendon, or both. The equivalent injury to a ligament is a sprain. A sprain, involves damage to one or more ligaments in a joint, often caused by trauma or the joint being taken beyond its functional range of motion. The severity of sprain ranges from a minor injury, which resolves in a few days to a major rupture of one or more ligaments requiring surgical fixation and a period of immobilization. Sprains can occur in any joint but are most common in the ankle and wrist. Decreased ability to move the limb. If a ligament ruptures, one may hear a cracking sound. Difficulty using the affected joint (i.e. : weight bearing if it’s a weight bearing joint like the knee, ankle or foot). The inflammatory phase can last up to 14 days but peaks from 24-48 hours after an injury. During the inflammatory phase the body removes the dying or dead tissues to reduce the chance of infection. Heat and redness may occur at the site of injury. Blood vessels around the area of injury will start to clot while non-injured blood vessels in the area dilate to increase blood-flow to the injured tissue. There will also be increased cellular activity in the area and these particular cells are responsible for cleaning up the injury site and preventing infection. This phase lasts up to 21 days. The purpose of this phase is the formation of scar tissue to restore continuity of damaged tissue. Fibroblasts are cells, which help to form scar tissue. This phase can last up to almost 1 year following injury. During the remodelling phase the body’s main goal is to strengthen the newly generated tissue. The body will strengthen in response to forces applied to it. So what you do for treatment and or rehabilitation during this phase will have a large impact on the strength and health of the new tissue. Most of the tissue in the body (muscle, fascia, ligament, tendon etc.) is composed of similar components. Normal musculoskeletal tissue is designed to resist the loading and demands of daily activity. Injury occurs when this loading excess the tissue capacity. Body tissue like muscles and ligaments are composed of several basic components including: collagen, elastin, proteoglycans, water, cells and inorganic components. The role of the muscles of our skeleton is to coordinate joint motion and to withstand force. 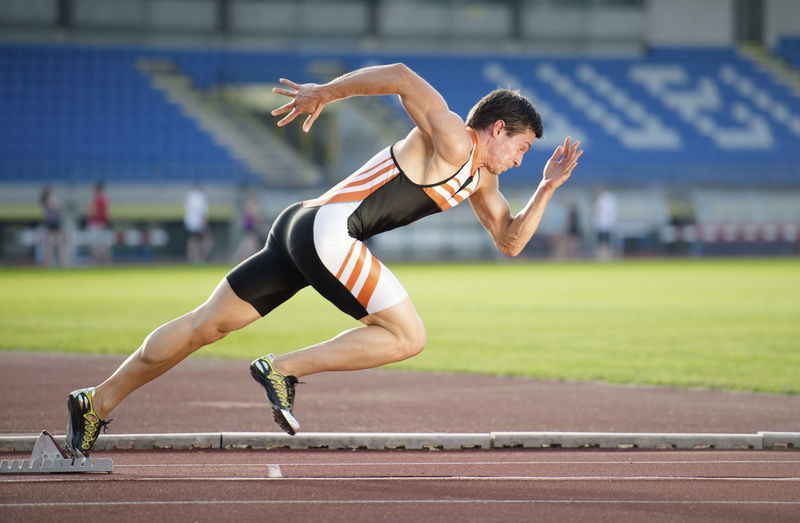 Muscle strains are often the result of high demand activities or from a significant amount of force. Muscles that have the greatest risk for injury are the ones that cross 2 joints. Examples include: the rectus femoris, gastrocnemius (calf), hamstring muscles. Strain: involves excess force leading to over-stretching of the muscle. Contusion: involves compression injury or direct blow to the muscle, which causes injury. Laceration: involves disruption of the muscle. First-degree strain (minor): involves fearing of few fibres, and minimal loss of strength. Second degree strain (moderate): more damage to muscle fibres with a loss of strength. Third degree strain (severe): there is a rupture of the muscle with complete loss of strength. A bulge may form where the muscle has been torn and may be accompanied by swelling and or bruising. Very small injuries to muscle repair however most muscle injuries heal with normal tissue being replaced by dense connective tissue (scar tissue). Unfortunately scar tissue does not have the same properties as muscle, and the formation can lead to an increase in tension in the surrounding muscles/fascia, and potential weakness. 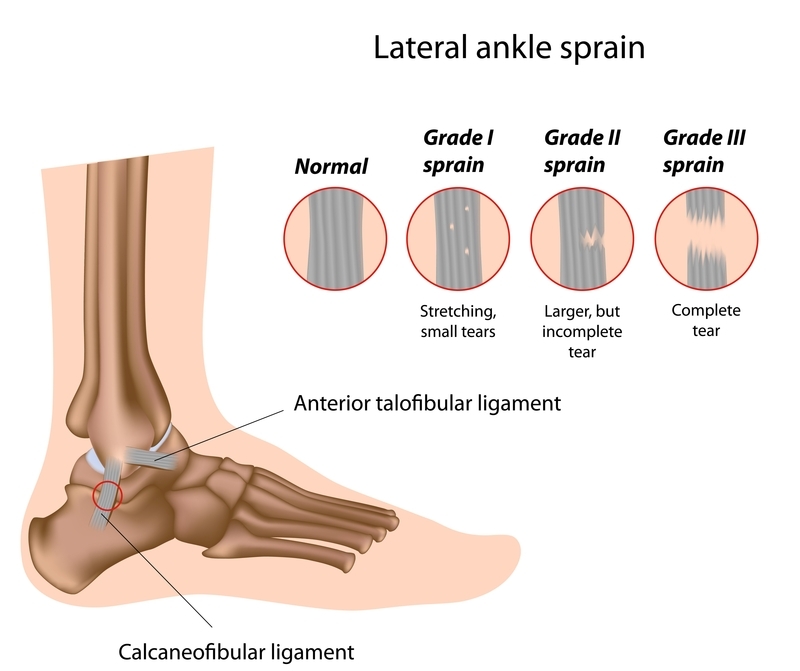 What causes a Ligament Sprain? Ligaments connect bone to bone and provide joint support. The main function is to withstand force in one or more directions while allowing movements. Ligaments are composed of dense connective tissue and unlike muscle they do not contract. Ligaments provide guidance of bone position during activities and give passive stability to joints. It also plays a role in joint proprioception, which is the sense of the relative position of the body segments in relation to other body segments. 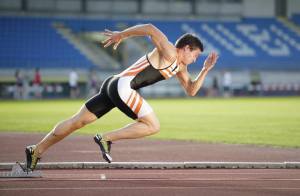 Ligaments are at risk for injury due to acute force or repetitive overload. They are of high prevalence in athletes or those who engage in exercise. Grade I: the ligament is stretched but there is no damage to the fibres. Grade II: the ligament is stretched with some fibres torn; there will be moderate joint laxity. Grade III: there is almost complete ligament tearing resulting in significant joint laxity. Rest following injury is important and most people already do this as part of the RICE principle for injury (rest, ice, compression & elevation). It’s obvious that taking a break from sport or exercise is important but depending on the severity of the injury complete immobilization may not be necessary. This is why it’s important to book in with your healthcare provider as soon as possible following injury. The chiropractors at mountain health and performance can assess any muscle or ligament injury, determine the severity and recommend appropriate treatment including at home advice. For example, following a mild ankle sprain some movement within a pain free range of motion can help to maintain blood flow & joint mobility, which is important for the healing process. Ice is also part of the RICE method for treating acute injuries and is commonly used immediately following injury. Ice has traditionally been used to decrease inflammation, swelling and pain. Though it is undoubtedly a great analgesic it’s effect on swelling, inflammation and overall healing is still under debate. There are many in the sports sciences fields that no longer recommend ice after injury due to a lack of evidence. As we discussed above, during the acute phase of healing substances are released by the body, which cause the blood vessels around the injured site to open up to increase blood flow. Since ice leads to blood vessel constriction, some believe that its use may actually slow inflammation and prolong the healing process. Short-term use of ice for pain control may be warranted but there are additional options for controlling the inflammatory phase in the clinic, which may help reduce the need for ice. Electrical muscle stimulation is a great option for reducing swelling and pain in the first 24-48 hours after injury. 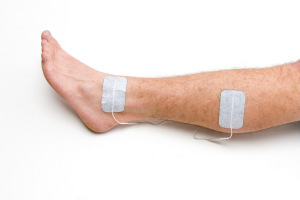 Muscle stimulation involves placing pads on the muscles and sending stimulating pulses through the skin and along the nerves that fire or activate the muscles. Electrostimulation promotes muscle contraction in a manner similar to a voluntary contraction. Electrostimulation can be used in two different ways: muscular stimulation (for the development of force), and nerve terminal stimulation (for treatments to alleviate pain). The lymphatic system is in charge of removing waste products from the swollen joint and muscle contractions are in charge of stimulating the lymphatic flow. However, if an injured person is unable to contract their muscles or move the joint, then an EMS can be used to produce twitch muscle contractions to act like a pumping system to get the swelling out of the joint. Any time a joint is “stuck” in one position for an extended period of time, the muscles that surround that joint can become shortened and/or spasm, which can cause more pain and decrease the range of motion of that joint. EMS can also increase blood flow to the injured area, remove metabolic waste and stimulate the muscle fibers. This allows the muscle(s) to relax, decreasing pain and increasing range of motion. 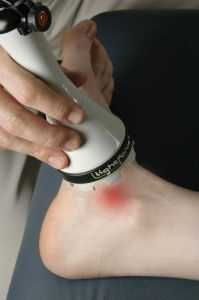 Laser therapy uses a process called photobiomodulation. Photons enter the tissue and interact with the cytochrome c complex within mitochondria. This interaction triggers a biological cascade of events that leads to an increase in cellular metabolism and a decrease in pain. Unlike medications, laser therapy reduces pain without undesirable side effects. When treating acute conditions with laser therapy, it is particularly effective when it is administered as soon as possible following injury (assuming there is no active hemorrhaging). The faster the inflammation is reduced and the healing process can begin, the better. In the case of acute injury, laser therapy helps restore the body to normal function quicker. Kinesiotaping can be used during all phases of healing. Kinesiotape is an elastic tape which provides support and pain relief while still allowing a natural, safe range of motion. This allows athletes and patients to participate fully in rehab and/or continue training and competing as they recover from overuse or injuries. During the acute phase the tape can help to decrease pain and help increase joint awareness. Following this the tape is used primarily to help support joint function during return to exercise and sport. The elasticity of kinesiology tape allows it to provide support to joints or muscles without restricting range of motion as traditional athletic tape does. The sensory feedback from kinesiology tape also discourages the injured muscles from engaging in harmful or inefficient compensatory movement patterns – all benefits that appeal to athletic individuals returning from an injury or those who are still looking to continue their training or fitness regimen as they recover. It’s no surprise that so many high profile athletes are wearing kinesiology tape and continuing to train and excel in their sport. 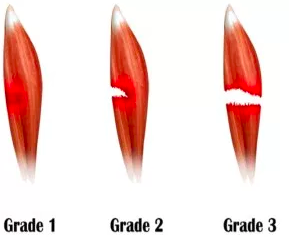 As discussed above, following injury muscle and tendon is replaced with dense connective (scar tissue) in order to restore continuity of the tissues involved in the injury. This scar tissue can lead to irritation of the surrounding tissues and activation of pain fibers. This tissue can also adhere to the tissues around it, which prevents movement and leads to poor function. This can create compensation, stiffness and dysfunctional movement. Myofascial Release Techniques are specifically designed to target connective tissue tension due to previous injury. These techniques can help to promote the formation of new tissue that has better quality, elasticity and resilience. Once the muscle or ligament injury has healed and scar tissue has formed, oftentimes the nearby joints have also stiffened. This reduced mobility can increase risk for re-injury or cause compensations that may lead to pain. Manipulation and mobilization can address any surrounding joint dysfunction as the body continues to move through the repair and remodeling phases of healing. It’s a common held belief that rehabilitation and exercise should begin once the healing process has finished. In many cases however, the earlier movement is implemented the better the outcomes for the healing process. Initial rehabilitation may involve very subtle movements of the joints and tissues, and or mild contractions of the muscles surrounding the injury. This may then progress to more forceful contractions along with exercises to help restore balance, coordination, & strength (using bands or weights). Doing the wrong exercises at the wrong time can definitely interfere or worsen injury this is why it’s always important to follow your Chiropractors advice following an in depth assessment.